Anarchism is "The theory or doctrine that all forms of government are oppressive and undesirable and should be abolished." [The American Heritage Dictionary of the English Language, Third Edition] Etymologically, 'anarchism' comes from Greek words translating as "an" (without) + "arch" (rule or ruler). Note that anarchism means without rulers, not without rules. The definition above is the most general of various definitions put forward by philosophers and political theorists. Naturally there are variations in formulation among the many diverse branches of anarchist thought. But a perusal of the literature makes it clear that all branches, from the ancient Chinese Taoists through the classical socialist anarchists to the modern anarcho-capitalists, agree to this core point that anarchism is anti-state. What is the proper purpose of the State? What is the proper extent of the State? Anarchism answers the first question with 'There is no proper purpose.' and the second question with 'none.' While anarchism is the radical absolutist position on the extent of the state, we can learn much from those who are close to the same ideology. In particular, there is a large body of literature by people supporting a strictly limited State. A government restricted to providing police, judicial and defense services is called a minimal state. Those supporting such a government are minarchists. 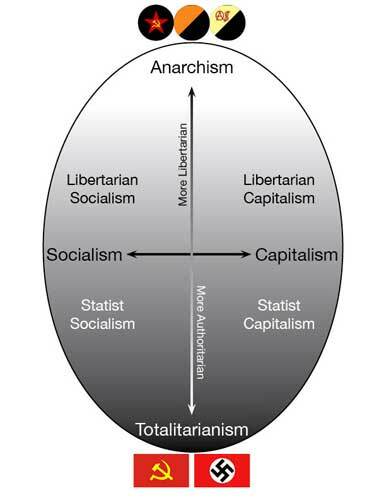 The term libertarian is used to denote the general anti-statist end of the ideological spectrum, and should be understood to include both minarchists and anarchists. Beware of provincialism by political writers who want to expropriate the word "anarchism" for their own particular vision of a stateless society. Some examples of sectarian definitions: Between Anarchism and Libertarianism by Jeff Draughn, Libertarianism: Bogus Anarchy by Peter Sabatini, and most notoriously the Infoshop Anarchist FAQ, often quoted by anarcho-socialist sectarians. This two dimensional model is familiar to many libertarians, but may be new to some readers. The ancient one-dimensional left-right ('liberal-conservative') model is insufficient to address the modern political landscape. One might argue that it has always been lacking, since it addresses only one of the two fundamental questions about government. ( 1. What is the proper purpose?, and 2. What is the proper extent?) The earliest use of the terms 'left' and 'right' as political descriptions was by European parliaments in the 18th century. Typically the aristocratic and monarchist representatives sat on the right side of the chamber, while the anarchists and reformers sat on the left. Clearly left-right usage at that time answered the 'extent' question, and would correspond to a vertical libertarian-authoritarian projection of our modern 2D model. Over time, left and right have shifted meanings. In the US today, left-right deals with purpose rather than extent. Thus it could be thought of as a horizontal projection of the 2D model. 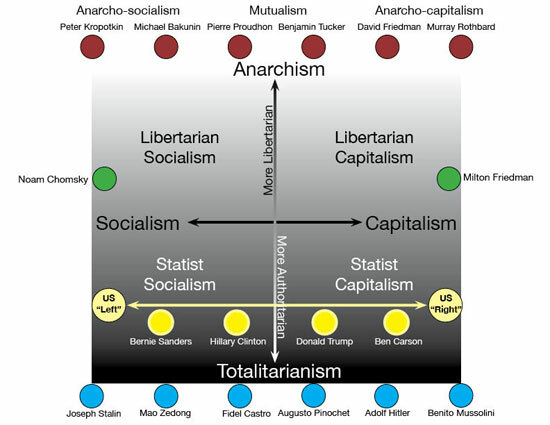 To see similar 2D political models, take the World's Smallest Political Quiz, or check out the essay Between Anarchism and Libertarianism by Jeff Draughn. The 2D model seems capable of handling a wide variety of political ideologies. In the following illustration, some positions have been marked. The map above allows us to classify political ideologies, but it does not give any idea of the compatability between them. 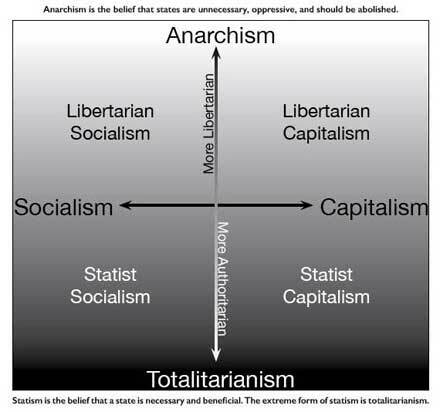 For example, the square map shows the same distance between statist communism and classical anarchism (Stalin and Kropotkin) as there is between anarcho-communism and anarcho-capitalism (Kropotkin and Rothbard). Since anarchists agree on the proper extent of the state (none), and since the purpose of State becomes less significant as the extent of the State decreases, the conflict regarding purpose disappears to the extent anarchism succeeds. In other words, the main reason that the treatment of property is such a conflict (in a statist environment) is that the power of decision-making is wielded by the State. Were such resource usage matters decided and arranged voluntary, such conflicts would be rather trivial. There is room for diversity and experimentation in property arrangements. Syndicals and corporations, co-ops and single-propriators, and families - extended, nuclear and communal - could all coexist peaceably in a stateless society. But the people will feel no better if the stick with which they are being beaten is labeled 'the people's stick'." A statist system--whether of a communist, fascist, Nazi, socialist or 'welfare' type--is based on the ... government's unlimited power, which means: on the rule of brute force." The victims of socialist forced collectivization and fascist concentration camps are equally dead. The jackboots of the oppressors looked the same to victims. Loosely associating ideological compatability with distance, we get the following map. The capitalist and socialist anarchists are very similar in ideology and evaluations on issues, other than those about property. And, as seen, the despotisms of the Fascists and Communists are more alike than not. Even in the "moderately" authoritarian range there is little difference between the e.g. Republican and Democratic parties, other than who they wish to plunder and who they want to favor with the loot. The author, Hogeye Bill, speaks from an anarcho-capitalist point of view. This was one of Hogeye's earliest anarchist articles, written in 1996. The graphics have been updated and minor edits made since then. For a socialist anarchist perspective on 'what is anarchism? ', see the essay by Liz Highleyman called An Introduction to Anarchism. Also, see an excellent reply to Sabatini's Libertarianism: Bogus Anarchy in Timothy Virkkala's essay Bogus Critique. Send comments to: abcritter@yahoo.com. Revised 1/29/2016.